Kenya, an east African nation, has a great deal of diversity—its population includes more than a dozen major tribes and its wildlife preserves are home to thousands of animal species. In First Come the Zebra, Lynne Barasch tells a story of cooperation— between tribes and between species. Here, the author/illustrator talks about her experiences in Kenya and about creating her books. First Come the Zebra was inspired by a trip you took to Kenya. Can you tell us about some of your experiences there? I had always wanted to go to Africa. The realization of this wish was greater than I anticipated. The vast plains stretching out as far as the eye can see, the sweeping skies, the variety and numbers of animals were all things I had hoped for. But standing in the tall grass, feeling the soft air, hearing the sounds of the animals—I knew this was an experience I would have to try to capture in a picture book. One day I opted not to go out in the Land Rover with the guide. Instead I took my little field set of watercolors and went to a wild area beyond the tents where we were staying. Three warthogs were grazing there. Quietly I approached, unseen by the warthogs. I found a small wooden bench and set up there, keeping my feet well up on the bench in case the warthogs noticed me and decided I was a threat to their territory. Luckily, they didn't, and I spent a few very happy hours closely observing and painting them. 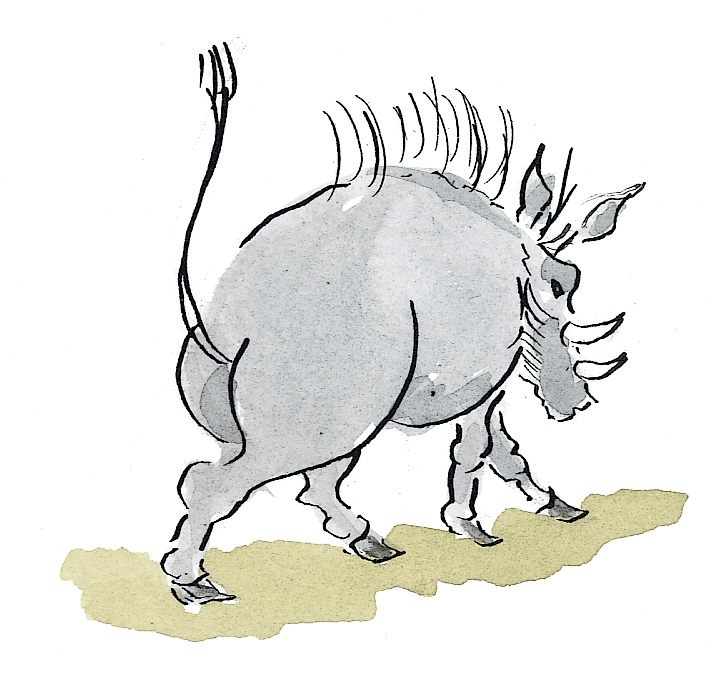 These warthogs became part of my story. I had my sketches for reference, which were especially meaningful as I remembered that beautiful morning. After your time in Kenya, did you do any research to help you write this book? What did you learn that surprised you? I read many articles and books about Kenya. A first draft of the story was circulated to several professors with extensive knowledge of African tribes for their feedback, some of which was incorporated into the final version of the story. Something that surprised me was the online chats that I found. Comments were sent back and forth by Kenyans who were surprisingly open with one another. They were young working Africans, and they were very aware of the harm tribalism was doing to Kenya. I thought these exchanges were evidence of hope for change. Can you tell us more about the tribal relationships and issues in Kenya? How close do you think those tribes are to achieving peace? Shortly after our return from Kenya violence broke out following the election of Mwai Kibaki, a Kikuyu. His opponent Raila Odinga, of the Luo tribe, and his many supporters claimed that the election results were fraudulent. Thousands of people were killed during this time. This news made me even more determined to write about tribalism in a positive light. The hope of peace will come from the next generation. As social change inevitably takes place in this age of the Internet, hopefully intermarriage and more relaxed attitudes will prevail. First Come the Zebra is your tenth book. Has your art and writing changed over the years? What have you learned? I hope my writing and art have evolved. Certainly, I keep learning as I write and illustrate more books. When illustrating another writer's work, I can see the difference between a non-artist writer and one who also illustrates. Writing with images in mind is different than writing only for narrative. But I just keep on doing the best I can. Some of your previous books, such as Knockin' On Wood and Hiromi's Hands, have been biographies. How is writing a fictional story different from writing a biography? All stories begin with something you have read about or experienced, but fiction moves beyond what is known. I love the freedom of writing fiction. Still, to be believable, fiction has to be grounded in some reality. Sometimes subconscious knowledge finds its way into a story. When I wrote Old Friends, it was years later that I had a flash of recognition and asked my husband if the main character reminded him of anyone. Immediately he answered, "She is your grandmother Helen, of course!" I had not known until that moment. How did you create the art for First Come the Zebra? Do you use photos or other images for reference, paint from your memory and imagination, or both? The art for First Come the Zebra was created using photos from the trip for reference, and from memory. In Kenya I took pictures of roadside vegetable stalls like the one in the book, sensing somehow that I would need this as reference later on. Where are you planning to go on your next big trip? In late January my husband and I are going with a Williams College professor of Archaeology to the Red Sea. We will sail on a small ship and stop in Egypt, Jordan, Israel, and Saudi Arabia. 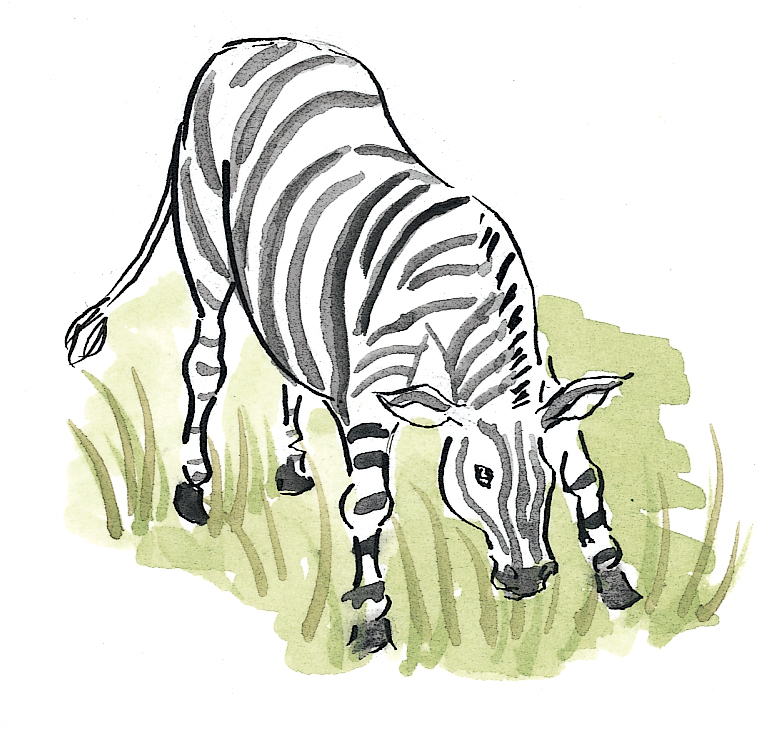 What do you hope young readers will learn from First Come the Zebra? I hope young readers will begin to see that they are not powerless. If every young person would take the initiative and try to understand and get along with someone different from himself or herself, the cumulative effect would have great impact. I want youngsters to know that they are the hope for the future of the world.